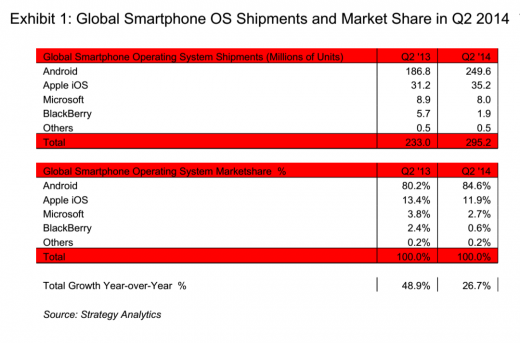 Market research firm Strategy Analytics new second quarter 2014 numbers estimate the Android platform’s share of the global market at a record 84.6 percent. Strategy Analytics reported 295.2 million smartphone shipments during the period, just 0.1 million off from IDC’s number. Growth seems to have tapered off, with the firm recording the market’s slowest growth level in five years. Android widened its lead on all its competitors. Apple’s share reportedly fell from 13.4 percent a year ago to 11.9 percent. Microsoft dropped from 3.8 percent to 2.7 percent, and BlackBerry shrunk from 2.4 percent to 0.6 percent.